In some ways, preparing your employment policies and procedures to meet the latest accessibility requirements is common sense. The AODA employment standards require employers to treat employees and job applicants with the same respect and dignity as any other person. In practice, unfortunately, it’s not always that easy. What exactly does it mean to consult with employees with disabilities in order to provide accessible documents and job supports? How do you prepare customized accommodation and emergency plans for employees with disabilities? What does an accessible performance management process look like? You’ve probably started thinking about these things. Maybe you’ve started drafting your policies or updating your existing HR policies. Now’s the time to put all your thoughts together into a coordinated plan to meet the AODA employment standards. We know that these requirements are demanding because we have heard about the challenges from those organizations with 50+ employees that were obligated to comply in January 2016. Smaller employers with fewer resources may need additional assistance to keep track of the project, including reviewing, updating and implementing many HR forms and documents such as job offers, employment contracts, job postings and applications to ensure they are consistent with the new accessibility standards. Remember, accessibility is an ongoing process and you likely don’t want to find yourself trying to play catch–up with AODA obligations that will continue to evolve for years to come. Therefore, it’s crucial to stay on top of the requirements now, including taking the necessary steps to meet the new employment standards. Last November, we published a free whitepaper, 7 Steps to Compliance with the AODA Employment Standards, to help guide employers through the challenges of meeting these new employment standards requirements from start to finish. I’ve included a brief outline of the recommended steps below, but I highly recommend checking out the whitepaper for the full commentary on how to achieve compliance using these steps. You can download your copy for free here. A lot of people tend to overlook this part of the process, yet it’s the foundation of good compliance practice. Before you can properly establish and implement a plan, you’ll need to understand what the current accessibility laws and obligations require of you and your HR practices. The compliance date for small organization with employees in Ontario to meet the new employment standards was January 1, 2017, while the date for larger organizations (50+ employees) was January 1, 2016. The goal here should be the removal and prevention of any barriers for persons with disabilities at all points of the employment cycle. 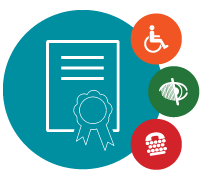 Create your policy for the AODA employment standards, including your organization’s statement of commitment to employment practices that are fair, accessible and welcoming for everyone. Your organization’s plan needs to indicate how you intend to implement the requirements for each employment standard. This includes descriptions of the barriers you’ve identified and corrective actions for those barriers. Once you are ready to roll out your multi–year plan, you will need to communicate the revised HR processes to management and staff and provide regular training so your employees understand them. Regularly check to see if management and employees are putting your new processes into practice according to your organization’s multi–year plan. For details on how to achieve compliance with the new AODA employment standards through these steps, download the 18–page whitepaper for free here. Good luck managing these requirements in 2017! If you need help meeting your compliance obligations, don’t hesitate to contact us. Copywriter and researcher at First Reference Inc.
Fred Stewart, BBA, is a copywriter and researcher at First Reference. He is a contributor to Inside Internal Controls and First Reference Talks. One of the topics Fred covers is the Not-For-Profit sector, a sector he has previously worked in. Some of the other areas he writes on include internal controls, employment law and accessibility. Read more.